It was a surprisingly productive weekend; lots of stock prep for the next couple of projects and the table top received its first coat of finish. The contractors finally finished their work so we were able to get the house put back together which meant I was able to dig out the table top and test how well it sits on the base in its final resting place. The fit was good but there were a few minor gaps so I carried it down the stairs to the garage and spent some time with my number 8 and flattened the bottom. I then squared up the ends with my low angle block plane and the edges received a chamfer to help minimize child damage. To speed things up, we decided to drop the breadboard ends and I decided to do something I hate and pulled out the random orbit sander. 120 grit removed most of the tool marks and then I wiped it down with a damp cloth to ensure there were no glue spots. 220 followed and the top was smooth enough for oil. It lost the character but we need a new table. The top received a nice soaking of BLO and then the residual was wiped away; this will sit for the rest of the week curing and next weekend it will receive a film finish (I’m off to New York City for work so it worked out well). Friday and Saterday ended up being about stock prep. All of the stock for my back stool is now S4S and I have the legs cut for my dining table bench. 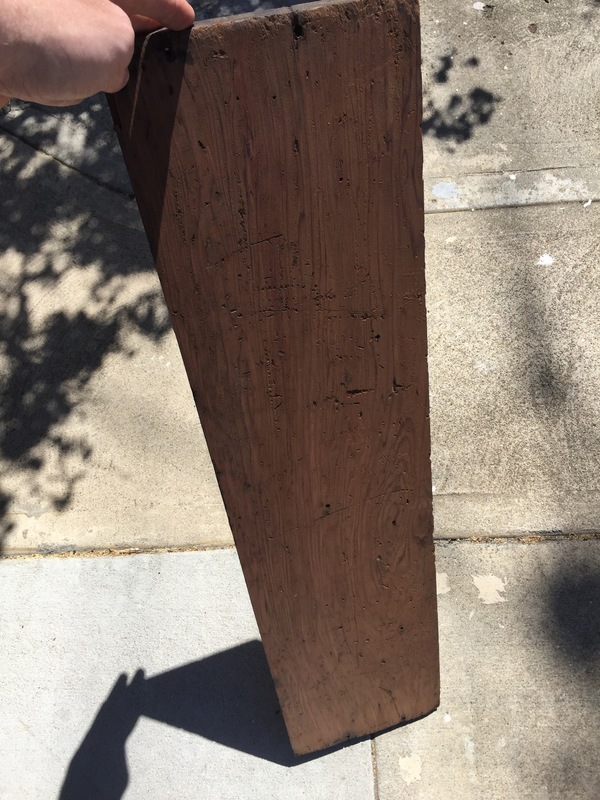 The back piece (which will be steam bent) was fenangled out of one of the eucalyptus boards that self destructed. One of the splits carried into the usable part of the board but luckily the planer took it out. The plus side was that my hand plane revealed curly figure that should add some interest to the finished peice. 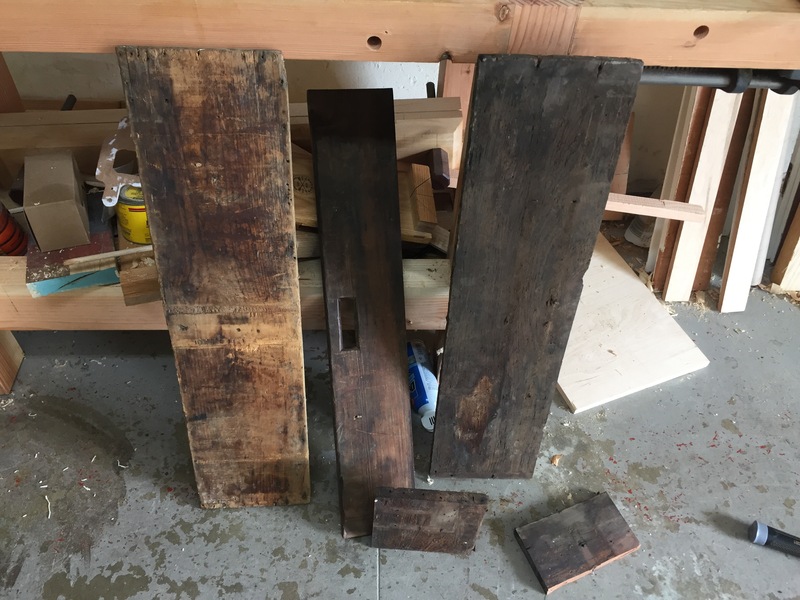 The other item was I finally broke down the last piece of the rotten tool box and found a few salvageable boards which will find their way into a project at some point. This is the right hand board that was the bottom of the tool tote. I’m assuming it’s redwood. Hey look, its a table base. I did not put in as much shop time this weekend as I should have but some good progress was made. On Saturday I spent several hours adjusting the leg assemblies. 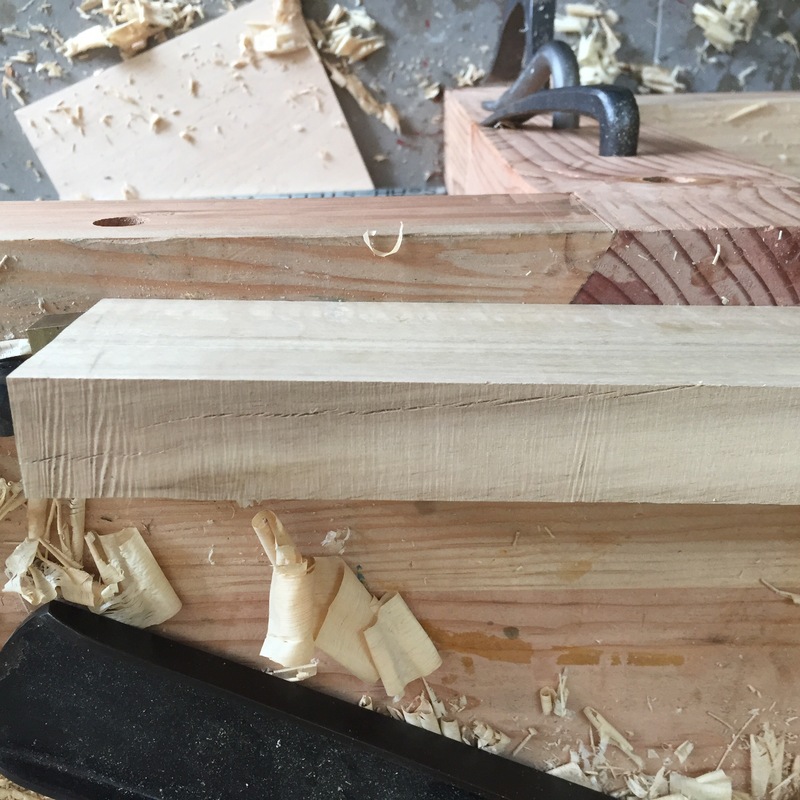 I sharpened my low angle block plane and shaved down all of the end grain portions, used my jointer plane to flush up all of the various parts, and adjusted the feet pads to bring both sides into square. After that I snuck up on the fit for the first tenon and managed to get it into place. 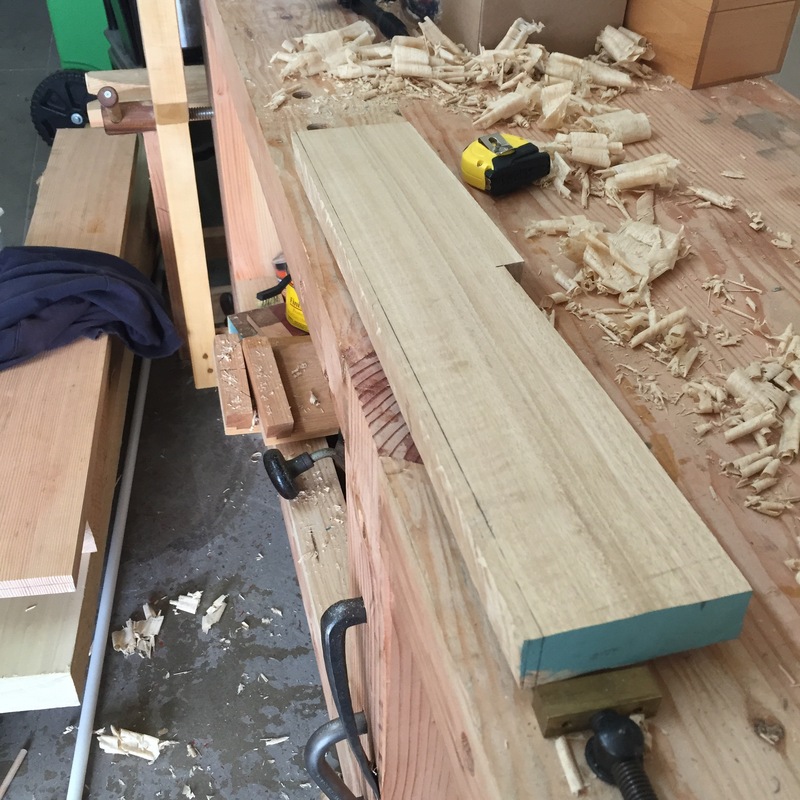 My #10 Carriage Maker’s Rabbit Plane made this process much easier. 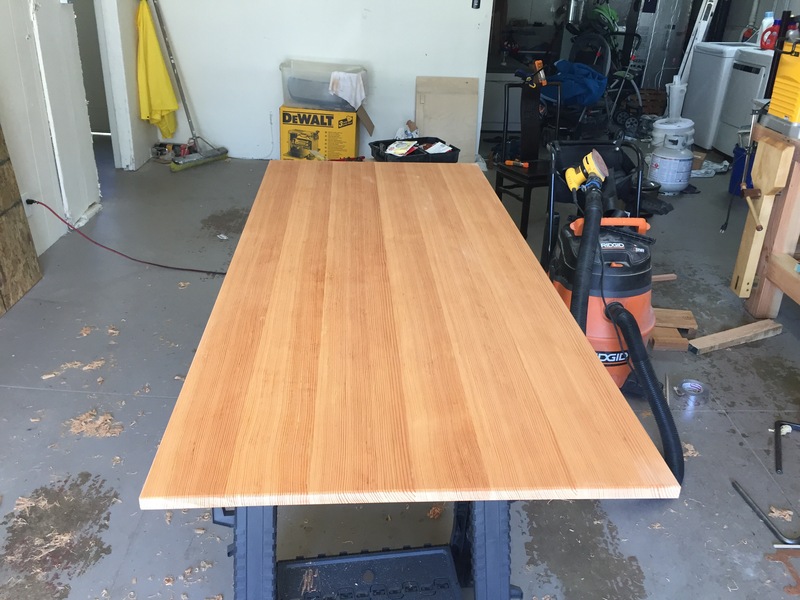 Since this was the first time putting the parts of the base together I wanted to take a look at how square everything looked but unfortunately, there are no flat floors in my workshop and my bench is not level (heavily sloped garage floor). 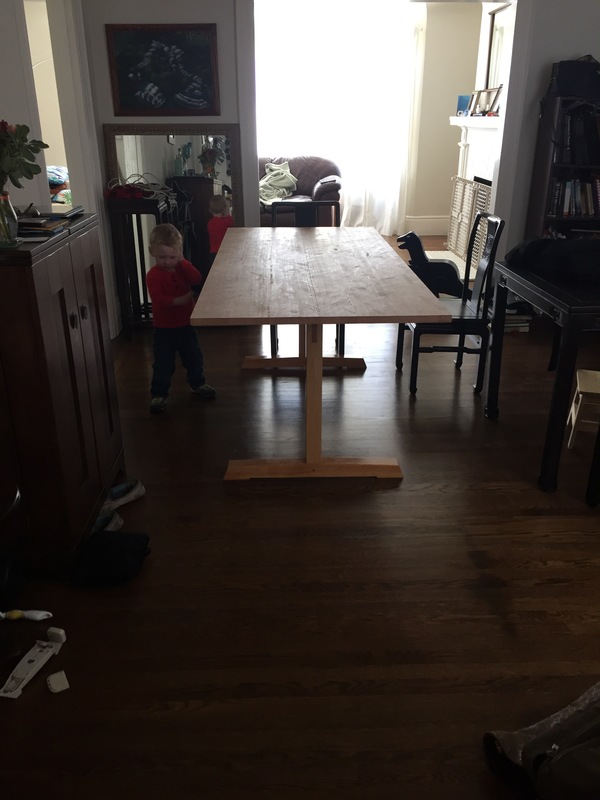 I carried the parts upstairs and dry fit them in the dinning room with favorable results. My wife decided she liked the danish modern look so the planned milk paint will instead be clear finish.